That's the sign that hangs on a wall in my home as a daily reminder to live in the moment. One of my students gave it to me as a gift before departing for summer break. She told me that out of all the life lessons she learned during the year with me as her teacher, enjoying life and appreciating the small things resonated with her the most. I often look at the word "pleasures" and make a game out of it. I try to find as many words as I can within it. Some of the words I've found include: pleases, ease, sure, leap, sleeps, slurp, reaps, and so on. It's a silly little game but I enjoy playing it. Cherishing life's simple pleasures is a spiritual practice. Simple pleasures point us toward the sacred presence in the world. They teach us about the lineaments of a whole and meaningful existence. When we act from the center of our being, when we become aware of the ultimate value of existence, when we connect with our authentic, deeper selves, we begin to take pleasure in every moment that is given to us. I have a friend who is a self-described orthodox hedonist. He believes the aim of spirituality is pleasure. And so, he lives his life discovering the beauty in each moment. There is nothing that doesn't fascinate him in some way. He lives in the here and now. To him, the little things are the big things. 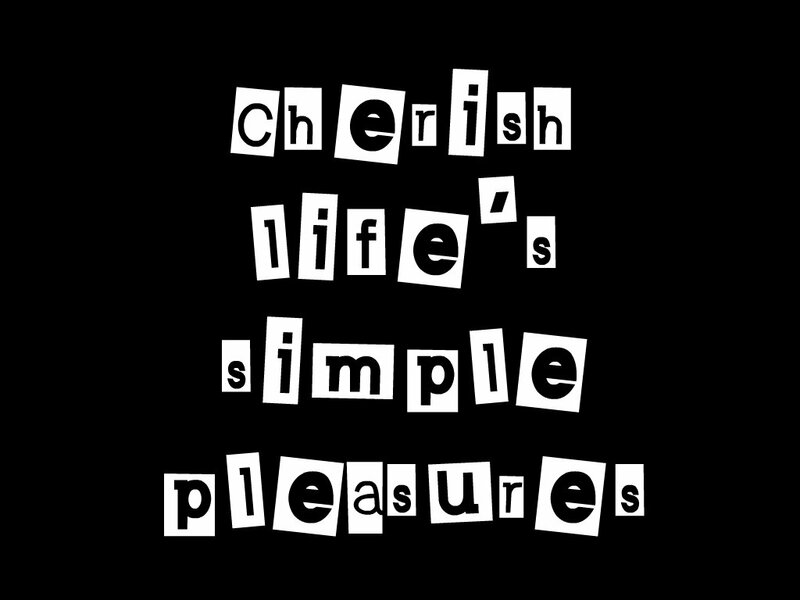 What simple pleasures in life do you cherish? I've always been very happy about it not taking much to make me joyful. It doesn't take much to get me excited over the little things,too, Kathy. There's joy in every moment when we allow ourselves to open up to it. Love it! This is such a beautiful post. Thank you for sharing! As an energy practitioner, I teach my clients about the importance of gratitude. I've found my heart is so full of gratitude for all that I have that I enjoy everything so much more. So the simple pleasure I enjoy is allowing my heart to sing in gratitude! Thank you Penny!!! Thank you, Loretta! The spiritual practice of gratitude raises our vibration and fills us with such joy. Here's to enjoying life to the fullest! This is beautiful Penny. Right now my simple pleasure is sitting in my lounge chair, reading a book, my camera by my side, waiting for dragonflies and butterflies to land on the flowers in my garden. The dragonflies seem to enjoy the flowers between 2-4PM. I've gotten some great images!! Peggy, I love dragonflies...I've chosen them as my personal power symbol in life. Each time I see one it is my reminder to give gratitude at that moment. That's a great idea about keeping a camera handy for moments when they land on flowers. I think I'll start doing the same and start a dragonfly scrapbook! Beautiful! Thank you! I would love to see some of your photos! Peace and love, my friend. Thank you Penny for the gentle reminder. I have a new puppy in my life who is showing both my husband and I that life is all about having fun. He has a good time and brings us along with him. You are very welcome, Holly! I absolutely LOVE puppies...we can learn so much from those little incarnations of love. Thanks for stopping by and commenting! Oh yeah! "When we act from the center of our being, when we become aware of the ultimate value of existence, when we connect with our authentic, deeper selves, we begin to take pleasure in every moment that is given to us." Well said my friend!! WOO HOO, Minette! Life is all about the lovin'!!! Thanks for commenting! Hi Carolina! True, money can buy a lot of things, but they can't buy happiness because happiness is an inside job. Thank you for teaching your children to appreciate and enjoy the simple things in life. They will thrive as a result. You're a great mom! Thank you very much, "Anonymous." I didn't know my blog was on Yahoo News. That's news to me! Thank you for letting me know. I'm a part of various blogger groups that autopublish my blog, so maybe that is how it appeared there. Try www.womenstoolbox.com and see if that will will help. Thanks for stopping by!